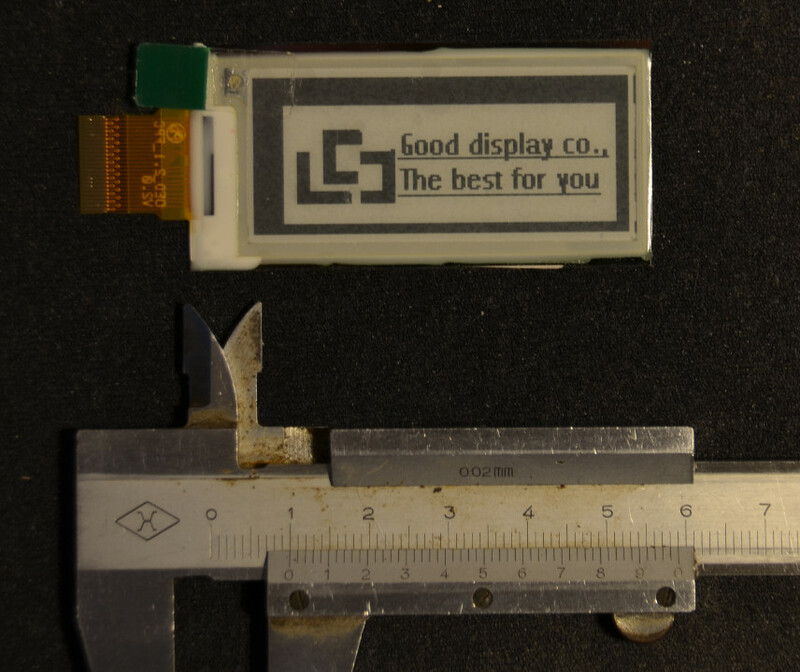 Look what I’ve got by post today from our Chinese comrades at ‘Good Display‘ factory: a nice small 2.04-inch electrophoretic display (EPD), or better known as ePaper/eInk display or ‘electronic paper’. Electrophoretic displays (EPD) do not require any power to retain an image. Power is needed only when redrawing the screen. The technology is thus used in electronic paper readers such as Amazon Kindle or the Pebble smartwatch (correction: Pebble uses different display: Memory LCD). 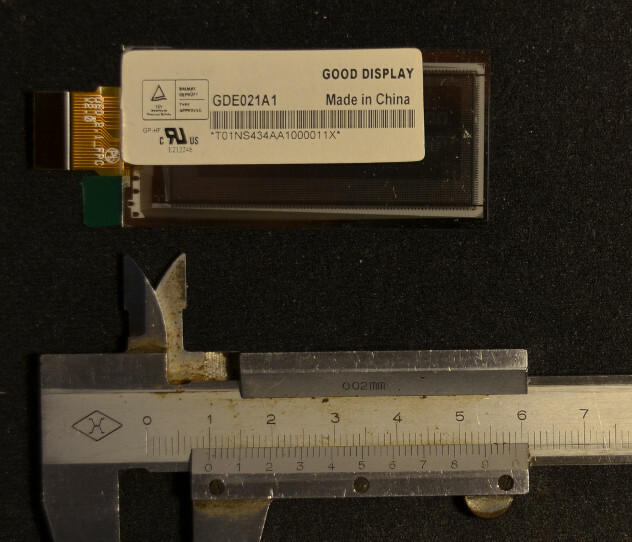 The unit I’ve got is 2.04″ display designed for use as electronic price tag at shelves in shops. The resolution is 172×72 pixels. It has 2-bit ‘colour’ depth, which corresponds to 4 grades of shade. The model number is GDE021A1. If I read the datasheet correctly, the display requires DC-DC converter circuit to supply relatively high voltage 40V for refresh. Luckily the DC-DC controller is integrated, but a power MOSFET, a coil, and diodes must be connected externally over the connector. All other communication with the display is via SPI-like interface, so it should be quite easy. I will get back once I have it working somehow. What is my target application? Well, I always loved Falout’s Pip-Boy (Personal Information Processor) device, but-you know-wearing a CRT on your wrist is not entirely practical (maybe unless there are mutant scorpions around). 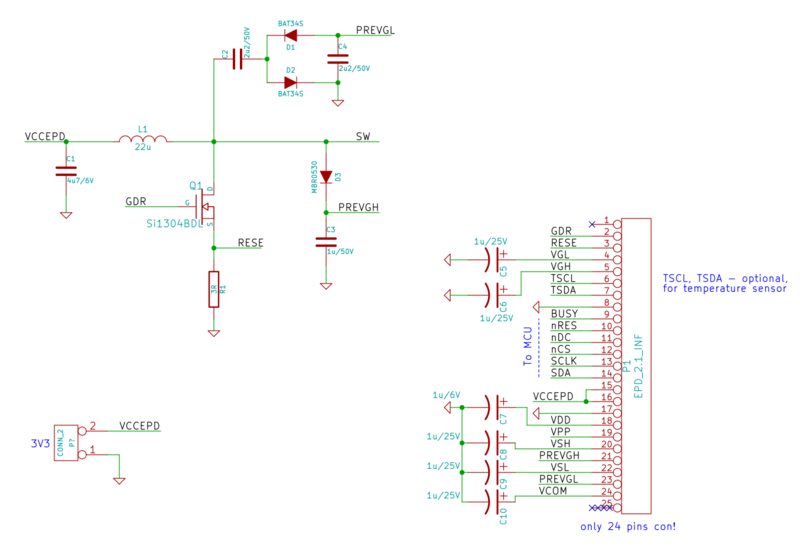 UPDATE 2014-04-28: Below you can find a driver circuit for interfacing to an MCU. It is redrawn from the datasheet. Wait a moment – could you clarify if this is actually an electrophoretic display or is it “the technology used in pebble”? Cause those are 2 completely different technology (memory lcd vs e-ink). The undereducated journalists making yet another pebble review could mix them all they want but I though your target audience are people with some educational background. So, could you be more specific? My bad, thanks for correction. This is electrophoretic “eInk” display such as in Amazon Kindle. Pebble uses different technology, I didn’t know. © 2019 Jarda's Spare Time Electronics. All rights reserved.